(Newser) – Five years after the repeal of the "don't ask, don't tell" law allowed gay sailors to serve openly, the Navy plans to name one of its ships after California's first openly gay elected official. 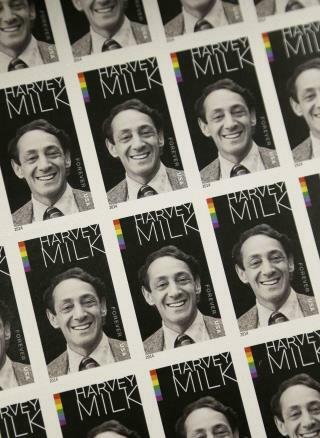 A Military Sealift Command ship, one of several John Lewis-class oilers currently being built, will be named after Harvey Milk, according to a Congressional notification seen by USNI News. Milk, whose parents both served in the Navy, joined the service during the Korean War and served as a diving officer on a submarine rescue ship. He was elected to the San Francisco board of supervisors in 1977 and was wearing his US Navy diver's belt buckle when he was assassinated in 1978. Naturally someone named Wiener would author a resolution to name it Milk. Why stop there? Just name it The USS Wiener Milk? [cups ear] What's that popping sound across the nation? Its the last cry of species Homophobis SilliestAssist. His fatal evolutionary flaw of having an explosive head finally doomed his race.